Nearly balmy, late evening winds greeted us in the port city of Vigo (pronounced “bee-go”) as we stepped off the last train on a day that was spent on trains—we had succeeded in making our escape from the snows and below freezing temperatures of Burgos and the mesa. “Mucho frío” (very cold) could now drop out of use from our short list of Spanish words. The climate change suggested by the sight of palm trees on the train station grounds suggested that our thumb tip skin that was frayed from the cold, dry mesa air would be healing soon. When we left Burgos in the morning we expected to end the day in Santiago de Compostela, but oddly, weren’t allowed to take the bikes on the last segment of train line to Santiago. Only by reading the fine print and persisting had we discovered that Vigo was the one coastal region town we could get to by train with bikes, so ‘Vigo or Bust’ became our goal that day. I’d never heard of Vigo but quickly learned that it is just miles north of Portuguese border and that the Prestige oil tanker sank off of its coastline in late 2002. The Vigo hotel clerk looked a little bug-eyed as we tapped on the locked glass door at almost midnight. I had made a reservation between trains in the afternoon but the sight of us and our bikes apparently didn’t fit with his expectation. It appeared that we were the only guests and our bikes had the locked garage to themselves. And the day clerk took in the entire process of us loading up and stashing the freshly purchased groceries—we seemed to provide much needed entertainment on that Monday morning in low season. We struggled to decide how to dress that morning and had repeatedly peered out the hotel room window trying to decipher the garb of the people on the street. On the mesa and in the snow, dressing had been easy: we just layered on everything that we had for cold or wet weather. But today we hesitantly left a couple of layers in the tops of our panniers, knowing they would be handy if we needed them. Our late night meant a late start the next morning, but we couldn’t have been more thrilled to be at the coast under that warm, blue sky. Within an hour of being outside we both sensed that a heavy burden had been lifted from our shoulders—we realized that in some ways we had been living like prisoners in the cold and could hardly believe our sudden freedom. Like school children on the first day of summer vacation, we barely knew what to do with ourselves in the warmer weather. The heavy city traffic, steep intercity hills, and auto exhaust were all in sharp contrast to the quiet back roads Bill had selected for our mesa riding. But we rallied our concentration to get out of town and began following the northwards, zigzagging path of the rolling coastline. The windy, mid-50˚ weather delighted us as we traced the fingerlike peninsulas around an enormous bay. Unlike the mesa and much of Europe, here it was more like the US, where the towns have built-up along both sides the main road. The result was almost continuous strips of urban commotion, forcing us to constantly watch for the doors of parked cars opening unexpectedly, cars or trucks backing out of head-in parking places, pedestrians boldly stepping out into traffic as they successfully do in Spain, and the occasional cat or dog out on their rounds. And then there was also navigating around the middle-aged or older couple or individual walking on the road shoulder with a wheelbarrow or garden tools and the donkey and dog that were parked on the edge of the road while ‘dad’ raked the steep hillside. There were consistently good shoulders and we felt safe enough with the always cautious and courteous Spanish drivers, we just had to be much more alert that we usually are on secondary roads. A few days later, we happily pedaled into Santiago as recent refugees from the snow and wind of the mesa rather than arriving as the more traditional pious pilgrims do on foot. For those of you who are like me and aren’t “in the know,” here is a bit of the biblical background and lore about the pilgrimage. ‘Santiago’ is the Spanish name for the Apostle St. James the Elder (or the Greater), who was the brother of St. John. They, along with Peter were the 3 most beloved by Christ, according to a museum brochure. Not long after his death in Judea, Santiago’s remains arrived in western Spain in an unmanned stone boat and were buried. Knowledge of the exact location of the site was subsequently lost during centuries of successive invasions. Then, early in the 9th century, a star led some shepherds to Santiago’s grave, hence the “Compostela” which may refer to a field of stars. Some years later a knight recognized as Santiago was to spontaneously appear in a battlefield and turn around the fight against the Moors in favor of the Christians. This was enough for the remains of Santiago to become the object of a local cult and then pilgrimage, according to our Michelin guide book. The Michelin guide also suggests that a 1130 pilgrimage guide to Santiago was likely the first travel guide book ever written and that it assisted some of the half to 2 million pilgrims per year in finding their way. Santiago de Compostela was one of the top 3 pilgrimage sites in the Middle Ages, after Jerusalem and Rome. Pilgrims trekked from as far away as Scandinavia, the Baltic States and the Slavic countries of Eastern Europe over successive centuries. Santiago’s relics (remains) were removed from the cathedral for safe keeping in 1589 after an attack by Sir Francis Drake on nearby A Coruna. But, as some of us have experienced, you can do too good a job at safe keeping and then lose track of the stashed items altogether, which is what happened to Santiago’s remains. ‘No relics’ meant ‘no pilgrimage’ for 300 years until the relics were recovered and authenticated by the Pope in 1879. So, once again pilgrims began walking the route to Santiago, a route which we have unintentionally crisscrossed as we were biking on the mesa. 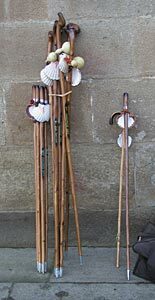 A fan-shaped sea shell is a common symbol of a Santiago pilgrim and is a motif that is integrated into the sculptures and facades in town and in the region. This symbol also has its story thanks again to the Michelin guide: a Christian noble on a crusade had to swim across an estuary. When he emerged from the water he was covered with shells, which then became a pilgrim’s symbol. The version of the story I read was far too cryptic to be convincing but the profusion of shells in town even today leaves no doubt that it was a compelling story at the time. In the Romanesque and baroque cathedral of Santiago, trekking and non-trekking visitors (some who struggle just to climb the modest number of stairs) engage in the rituals of pilgrims from the past. Inside the main cathedral entrance there is a polished section on a marble column that is the customary place for pilgrims to “touch base” and punctuate the arrival at their long sought destination. 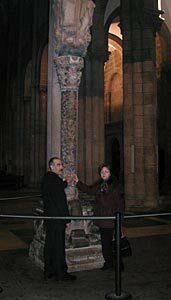 Around back of the same column near its base is a figure, presumed to be that of the cathedral’s architect, that many tap their foreheads against 3 times. Rather than salvation, this ritual is in the hope of transferring into your brain some of the genius of the architect. Those with insider’s information pause in a doorway towards the back of the cathedral with a hand on each side of the doorjamb, covering 2 crosses engraved in the stone. And we stood in line with other tourist’s and the faithful to file behind the 13th century, life-sized sculpture of Santiago which is a part of the cathedral’s grand altar piece. For a quickly made donation we could have placed a hand on each side of Santiago’s upper arms on retrofitted protective little platforms. Apparently in bygone days you could even swap your hat for Santiago’s crown for a moment. Following the pack then took us down into the crypt under the main altar to view the silver sarcophagus purported to contain the well-traveled remains of Santiago and 2 of his disciples. Santiago de Compostela indeed delivers the charming old town that the tourist literature describes. Of course, blue skies and no rain would have added to the pleasure of exploring its stone lanes and winding old town. The cathedral itself, the large square in front of the cathedral and the surrounding building all seemed to be on a more pleasing scale than many old towns we have visited. The middle storey of the adjacent monastery is at about street level and the visitor walks down one of the 2 curved staircases to enter the chapel, giving a satisfying, straight-on view of the façade that mimics an alter piece. Rather than just overwhelm the viewer as seems to be the intent of many religious facades, this one is designed to really be confronted and examined. The many different levels of the town and plazas that wrap around the cathedral give a pleasant and yet not too physically taxing perspective of all the grand architecture. It’s more of a “reach out and touch it” relationship rather than the more familiar “stare up at it” type of experience that we have with most European architecture. And while touring cathedral’s museum, we were once again dumbfounded to run into our old historical buddy, Don Juan of Austria. Bill is still wondering what a remnant from the 1571 Mediterranean Battle of Lepanto was doing in Santiago, but there is was, some faded tapestry or banner from the galley ‘Real’. Unfortunately even the new Spanish dictionary that Bill had downloaded from the internet onto my handheld computer couldn’t fully reveal the function of the fabric, but there was no doubt about its place in history, whatever the exact purpose of the item. You may be noticing as we have that in this central and western part of Spain the sight seeing attractions are pretty much limited to religious artifacts and celebrating the embellished reputations of Middle Age heroes. The Celts were here and should have some nifty burial mounds, the Romans surely left more than aqueducts behind, and we’ve seen cool pictures of megalithic stone structures but we aren’t having much luck tracking them or any of this other history down. Then there is the ‘dirty laundry’ that doesn’t seem to be discussed, like the Spanish Inquisition and the Prestige oil tanker ship that ran aground around here less than 2 years ago. There certainly is more to the history of the region than the Middle Ages but our questions to the folks at museums and tourist info only yields shoulder shrugs or pointing to the layout of the museum on the brochure. Perhaps it’s all in the basement of Madrid’s archeological museum. We had expected the weather to be the big uncertainty Saturday morning when we rode out of Santiago de Compostela, as most of our sightseeing there had been in the rain. But the clouds held onto their moisture and left us alone to unexpectedly deal to with our guts. I chewed on Pepto-Bismol tablets while Bill ducked into a gas station market just out of town to replace the water in our bike bottles with bottled water--just incase the hotel water was causing the discomfort in our bellies. (A note in a hotel drawer elsewhere in Spain recommended not drinking the water even though it was potable.) A half hour later I hailed Bill to stop at a pocket park in the small town we were rolling through so as to better assess my health. He informed me that the next town certain to have a hotel was another 15 miles into our 45 mile day and that if there was any question about me being able to go on, that we would do well to stop now. I was soon curled up on a cold stone bench feeling worse and worse. Bill was only slightly under the weather and headed out to locate the nearest hotel. Our 2” thick book of Spanish hotels didn’t list any lodging in this suburb of Santiago, nor were any of the people he asked on the street encouraging. But persistence paid off and he found a comfortable countryside hotel 2 more miles down the main road and a half mile down a local road. I wasn’t sure how I would ride, as just sitting up added to my distress. But the waves of nausea had passed and I assumed we would manage to get to the hotel one way or another if I could just get myself on the bike. Amazingly, my legs responded and seemed to pedal out of habit and head down, I followed close behind Bill as he carefully signaled all of the traffic and pavement hazards. I think my gut must have been in shock with the exertion as it didn’t grind me to a halt as I expected. Soon enough I was moaning and feeling sorry for myself in our new room as Bill did all the schlepping of our gear and stowed my bike. He then headed back to town to find a market before they all closed for the weekend. We still didn’t know what nailed me but were committed to drinking bottled water for a few days to be on the safe side. He also brought back a stash of soda pop, which we essentially never drink, assuming it would be the first calories I’d be able to ingest. Shortly after Bill returned from shopping I was throwing up in the bathroom—so much for those waves of nausea having passed. He loaded me up with ibuprofen to ease my aches and pains and Cipro to kill off the lingering bugs as soon as I could keep them down. Amazingly, after feeling ‘take me out and shoot me’ horrible for about 4 hours, I quickly was on the mend--either on my own or because of the antibiotics--just as Bill was starting to crash. Even when we are infected with the same bug at the same time, we never hit bottom with our illness at the same time, which is very, very helpful. The only thing that was odd with this insult was that I got sick first and up until this Bill has always gotten nailed first. There went his plans for cheerily catching up on his website chores while I spent the rest of the day in sick bay. By dinner time I was ready to nibble on a little bread and take a short walk and Bill was feeling bad but had yet to hit bottom with his version of our illness. As usual, Bill got the diarrhea variation of the bug and had a long, very uncomfortable night. By morning, he was just able to dine on my leftovers of soda pop and the smallest bit of day-old bread. The allure of one of the sunniest days we’d seen in weeks and the chirping birds was enough to convince us to move on even though we were far from recovered--being outside was more inviting than spending another day in our now stinky sick-room. We slowly packed up and prepared to spend the entire day, if needed, riding 15 miles to the next town with hotels. We headed out on the windless morning pedaling like we were straight into a headwind on the mesa as our legs were uncharacteristically reluctant—and that was on the short flat stretch. Then the major hill that the map hadn’t indicated presented itself. We struggled up the unexpected 1300’ of gain in the course of just 6 miles. We must have stopped at least every half mile to rest, nibble on fresh bread we had bought and sip a little more bottled water. Since I was now the relatively healthiest of our duo, I returned Bill’s favor from yesterday and led the way by setting a slow pace, pointing out the obstacles and judging the traffic while he dedicated all of his attention to staying upright and keeping his pedals going ‘round. The varied scenery of the climb to the summit, the few cars and the brightness of the day left us with no regrets about heading out—so what if our pace was more like that of a walk than a bike ride. We welcomed the chance to let our muscles ache a little from exertion rather than just from the tension of being ill and hoped that revving-up our systems with exercise would speed our recovery process. Plus, it was just too glorious of an early March day to have been spent in the shadows of an unheated small room. We arrived in our destination coastal town of Noia by mid-afternoon no worse off than when we hit the road in the morning. Still more under the weather than I, it was Bill’s turn to rest in the park while I searched for the waterfront hotel he had selected from the guide book. I was lucky—at least we knew that there were hotels in this town. We savored the long afternoon and evening of rest in a hotel with an estuary view and again headed out the next morning, pedaling our way west and north along the convoluted Spanish coastline at a snail’s pace. Bill relapsed after about 48 hours whereas I just had a slow, steady recovery. Bill commented over and over again on what a nasty bug we’d picked up, though we don’t know what the source of it was. How amusing to see us—those folks with dietary prissiness--reduced to living on white bread and soda pop for days. No ‘10 servings of produce’ or measured amounts of protein—we were just drizzling in simple sugar calories as best we could. The easily digested sugary drinks hit the spot, especially since we could only take in the smallest bits of food or liquid at a time. We’ve often lamented the hours we spend each day buying, preparing, and eating food and Viola! all of that was behind us. We consumed so few calories in a day that our time spent with food was down to next to nothing. We didn’t even have to stop pedaling to pee ‘cause the combination of the illness and cool weather severely dampened our thirst and liquid intake. You might wonder how and why we continued riding in such a marginal state. But the thought of sitting in one small room for more than 24 hours was enough to drive us out each day. Plus, the proprietors in western Spain aren’t as generous with their heat as elsewhere in Spain, so staying put a day would mean spending the daylight hours without heat—an especially grim picture on the overcast, damp days. Even when Bill relapsed and had a lot of GI cramping, he was unusually motivated to hit the road, however slowly we traveled. And some days each hour was peppered with multiple stops so he could gather his strength to go a little farther. But each day we were rewarded with little delights that made us glad we hadn’t sat out the day, things like a pleasant exchange with the man selling fresh bread and produce out of the back of his truck; snapping photos of bold, hungry gulls; and chatting with a local Spaniard who had lived in New Jersey for 36 years. In addition, all of the visual stimulation of the coastline and countryside was a welcome and heartily appreciated distraction from our discomfort. Riding while mildly ill in a fairly populated area also provided us with a safe way to explore our edge: to learn what our limits are for riding with an illness. The information gained should help us make better decisions in a more difficult situation in the future. Exploring our edge has paid big dividends in other arenas, like in riding at altitude and climbing steep passes. We frequently draw on the lessons we’ve learned in those more extreme situations. And with this illness, we have been drawing upon what we learned when I had food poisoning in Death Valley and we really did need to get going to stay on schedule to catch a plane. There we learned that the body has a back-up system for releasing calories when the gut isn’t available to do the job—I remember riding for a day or 2 without eating much at all. When healthy, I would keel over from hypoglycemia if I didn’t eat, but the all too familiar hypoglycemia doesn’t hit with some GI illnesses. Bill was hit much harder than I was with our mysterious GI bug. I was out for a walk and nibbling on food hours after the onset of my illness. At week’s end, my eating habits were almost back to normal and I was rediscovering forgotten body processes like hunger. Bill relapsed and had to take a longer course of antibiotics. And after several days, he was then trying to sort out which of his icky symptoms were from the bug and which were from the drug side effects. A week after becoming sick he was craving food but still barely able to tolerate enough to keep him going. I wasn’t a 100% at that point, but I was engaging with the world whereas he was stuck in that unhappy phase of wondering if he would ever be well again. It’s a bit overwhelming to think how we would have handled this illness had we been in a more remote area with fewer tourist services when the symptoms really hit. As I think back, it is probably is the first time either of us has been overwhelmed by a GI bug while actually pedaling—the few other memorable illness hit when we were already lying over in a town. But, one of the always-reassuring things about bike touring is that we are never far from people for long and if we really get in a bind, we feel confident we can summon help. Coincidentally, while we felt like we were having near-death experiences with our GI illness, we were touring along the Costa de Morte (‘coast of death’ because of the fiercely felt Atlantic storms). But as we rolled along on these pleasant coastal roads in western Spain, I struggled to see much that shouted “Spain.” It definitely looks like Europe with red tile roofs, noisy little cement mixers on the sidewalks, laborers in their distinctive bright blue overalls, and the proliferation of little shops and churches. But as I watched the little regional differences that come and go, I realized that they could be in any of a number of countries. The mud brick buildings of the mesa have been replaced by stone. Some of the 2 and 3 storey homes and commercial buildings are constructed with huge hewn stones that would give an ancient Roman architect itchy fingers, others are artfully arranged natural stone and some have a stucco finish. Stucco is definitely “in” in some towns on the coast and “out” in others. 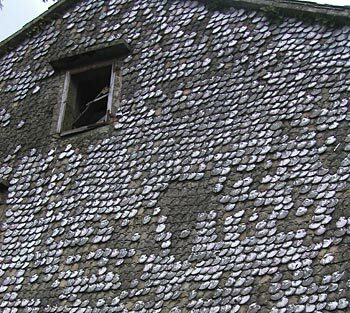 Some communities favor tiles or mosaic-like tiles on their facades and a very few sport an outside wall covered with fan-shaped seashells (something we’ve never seen before). The architectural detail of most of the churches is muddled not by big-city pollution but decades of moss and lichen accumulations. The hillside vegetation repeatedly shifts from coastal pines to Scotch broom and then to low growing scrub. And the occasional grape vines and the palm trees make us think of other Mediterranean coastlines, like Croatia, except for the huge cut-stone “fence posts”. 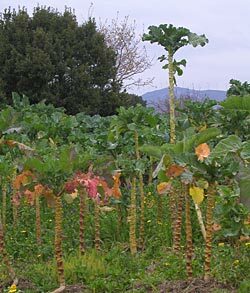 I believe the great stalky plants that we see in the home gardens are what we see in the store labeled as chard. I haven’t grown chard but always thought it was a low-growing plant back home. In Croatia a similar, tasty plant was translated as “mangold”. The most surprising vegetation is the tall, blooming Easter lilies growing almost like wild flowers along side the road. 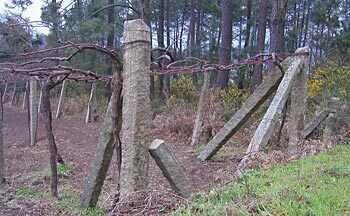 In the town of Carnota on the “Costa de Morte”, home gardening appears to be a community affair. Today, gardening was a team work activity: we’d see a half dozen women turning the soil in a small plot of land or a dozen middle-aged men and women working in a larger plot behind a tractor tilling the rich-looking brown soil. I wondered if it was time for planting potatoes as in town I spotted an older woman with 2 pails of cut potatoes. Farther south a few days ago, planting seemed to be a more private affair, as we were seeing just one or two adults hoeing or walking to a small plot of land. And the standard uniform for middle-aged and older women slowly shifts as we move along the coast. In some areas dark blue or black pants and tops overlaid with a thin, plaid and sleeveless house dress is the thing to wear, either when walking to the market or hoeing in the garden. A day later, pants and house dresses are out and black hose, skirts, and sweaters are “in”. As in Greece and southern Italy, my black winter clothes are the right color here for my age but I am years behind in suffering from the compression in stature that these women experience—my height-girth ratio is (thankfully) all wrong for my age group in this region. Mangold in a community garden. In Galicia (ga lee THHEE ah), this northwestern-most region of Spain, elevated stone granaries are definitely popular and distinctively Spanish. We visited either the longest, or one tied for the longest, in Carnota that was built in the 1760’s in response to some hopefully friendly local competition. We’ve seen hundreds of more typically-sized granaries oddly placed in backyards, front yards and now awkwardly on the edge of the new road. Our guide book states that they are no longer used to store grain but instead a place to stash backyard junk. But though their utility may have dwindled, their place as a regional icon is secure, as their forms are mimicked on bus shelters and in yard decoration miniatures. I’m still waiting to see the granary motif on a dog house or dumpster. Like the women’s clothes and gardening traditions, the granary designs slowly transition as we move north. In the south they were all be made of hewn stone, a little farther north they were constructed with found rock with a few huge cornerstones, and even farther north they are made of vertical slats of wood. In some areas painting them white is cool, in other areas “au naturel” is the only way to go. The first ones we saw were elevated on giant rocks stilts shaped like mushrooms, whereas farther north they are like a second storey on a small building. 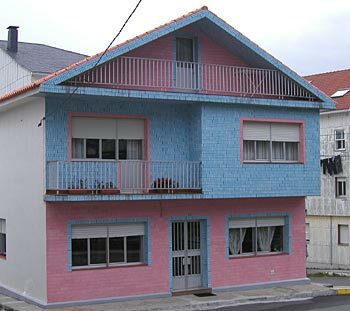 No doubt someone has already done the coffee-table book “The Granaries of Galicia” featuring even more variations. Carnota's oversized elevated granary from the 1700's. The Galicia coastline was described as fiord-like, which seems a bit overly dramatic. It is indeed an extremely complex and convoluted coastline with numerous bays and estuaries. But the elevation changes aren’t dramatic and rather than cliffs and sudden drops, most of the land tapers into the sea. It does however make for very pleasant and visually interesting riding. And it turns out that the non-Middle Ages history we craved had been ahead of us--we had just been a little impatient. We rode by a small work crew of women in ‘haz-mat’ protective clothing and masks that were power washing oil from the Prestige tanker off the huge boulders at water’s edge, one rock at a time. And the megalithic dolman rock structures started showing up on our map, though we couldn’t find our way to them. Even a Celtic site with interpretative center was in our area, though it is only open in July and August. So, though we weren’t actually seeing the finds of ancient history, they were starting to be talked about. 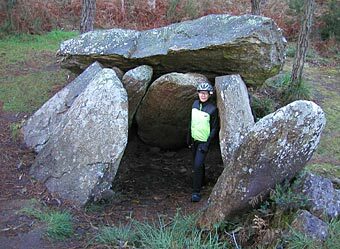 We did eventually track down 2 dolmen, or rock slab structures, from about 3000 bce, even though the best preserved one in the region is currently closed to the public. And later in A Coruna we did see the foundations of a Roman lighthouse. 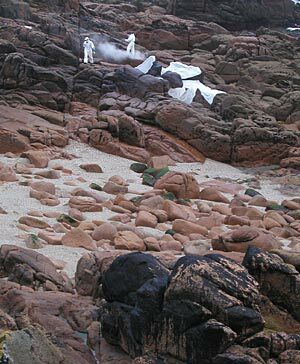 Cleaning the Prestige's fuel oil off the rocks. As we crept north along the coastline, I was so grateful that our spell of illness occurred on the Galicia coast and not the mesa. As is often the case, the coastal region is visually very interesting. There weren’t any big “Wow’s” but there was enough to engage the mind. Our snail’s pace gave me plenty of time to digest the nuances of the scenery and culture (while my gut was able to digest little.) I know that those of you who have ridden with us can’t imagine how we could ride any slower, but we have managed to. Since Bill suffered a relapse and I didn’t, he has needed frequent rests to belch, catch his breath and recover from GI cramping. And I had had no trouble filling these intervals with gawking at roofs, facades, gardens, and people on the road. The long interval and slow pace in visiting this region has allowed a little deeper awareness to seep in regarding what life in these parts is like. A collapsing, 3000 bce burial dolmen. The fishing fleet in this region is one of the largest in Europe. If the criterion is number of boats, it’s easy to believe its true as most of the boats we see are 1 and 2 person vessels. Most of the small ones are wooden row boats and slightly larger boats with outboard motors. Then they progress to similar sized boats with partial cabins to stand in. Few of the boats we see in the harbors are big, complicated affairs. Guys shuffling along in hip-high waders, wet suits on the clothes line, stacks of crab pots and drying nets are all common sights. Occasionally we’ll see a few middle-aged men patiently mending nets and there are always a substantial number of men milling around, both those who look like experienced seamen and those who look like experienced observers. One sight missing from the many coves and harbors we pass in a day are the sleek, manicured leisure craft that fill many ports in the other coastal regions we have visited. After so much time on the Galician coastal back roads and in the small fishing villages we couldn’t help but expect the next big city, A Coruna, to be provincial. 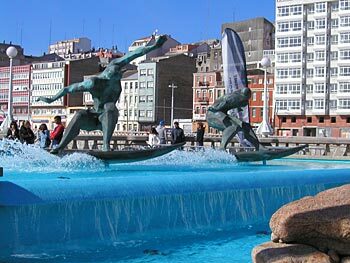 But A Coruna wastes no time in dispelling that bit of foolishness. It is a bustling city of a quarter million people with a lively old town and grand parkway lined with beautiful, turn of the 20th century architecture. Many of the inviting public spaces have plaques indicating they were done or redone in the 1990’s. And the sporting attitude of the city planners shines through in a fountain that appears to have been designed for surfboarders to rinse themselves and their boards in after their bout in the ocean—at least if that wasn’t the designer’s intent, the city’s guardians have made peace with its current use. A Coruna wraps itself around a ‘to die for’ convoluted coastline of multiple bays, inlets and harbors. Much of the city’s coast is outlined by a broad, paved pedestrian way with an adjacent 2-laned bike route. The views are stunning along the promenade, with alternating vistas of waves crashing against rocky cliffs and broad beaches filling in the concave curves. A Middle Ages light house dubbed “The Tower of Hercules,” with its excavated Roman foundation, was one of the special treats along the way. The lighthouse is billed as “the world’s oldest working lighthouse” but that seems a bit of a stretch. It was built under the Roman Emperor Trajan during the 2nd century ce to guide Roman vessels going to the British Isles for metals. But the lighthouse fell into disuse, as did so many relatively modern conveniences, with the disintegration of the Roman Empire. The port didn’t become active until the area stabilized again in the 13th century and like many monumental Roman structures, the lighthouse became a ‘cash and carry’ quarry for other projects. It wasn’t until the late 1700’s that the lighthouse was rebuilt to guide Spanish ships returning from the America’s and the Indies. Though only bits and pieces of the current lighthouse are Roman, we enjoyed adding the sight of another Roman artifact to our imaginary Roman scrapbook. But enough about those old Romans, did I tell you that we LOVE our new bikes? They are simply wonderful and have lived up to our wildest expectations. We don’t know how Bernie does it (despite the headaches), but there is something about the geometry of the new frames that gives both of us more power and climbing up those hills is even more doable. I am sorry we won’t be taking these babies over the Alps this year as I’d love to see just what they could do. Some days they feel like they could pedal themselves up the hills if we weren’t loaded down with all this gear. I blissfully no longer have to contend with the wobble that sometimes had me gyrating down the road. That extra stability of the frame has done two other things for me: one is that I can use my aero bars for a change in riding position any time I want, not just when the wobble isn’t acting up and two, I need less of a running start to get going on a hill than I did with the other bike, which is a real confidence builder as that need sometimes arises multiple times in a day. Perhaps with a little more practice I’ll even be able to start-up in as tight of quarters as Bill routinely does. Bernie scored with the fit and function of the new frames and Bill scored with all the parts he painstakingly selected. Every item on the bike was carefully chosen and more than one bike mechanic in Portland nodded with approval at his many deliberated purchases. Some items like the wheel hubs and headset are high end products for the durability and others, like the suspension fork and disc brakes, are lower-end for sturdiness and ease of maintenance on the road. Every part was carefully picked to give us maximum performance for a minimum of headaches while touring overseas. The front suspension and new handlebar padding are helping Bill’s chronic tendonitis in his hand finally heal and we both love the greater comfort afforded by the suspension. Both the suspension fork in front and suspension seat post in back smooth out the bumps without us being aware that they are doing anything—which is perfect. The mountain bike wheels and better fender clearance make us more confident when we slog through mud as we know that our tires won’t get glued to the fenders. The smaller mountain bike wheels solved the toe clearance problem and also lets us stay cleaner as the fenders can be properly positioned to cover the mud-flinging part of the tire. We’ll never be without disc brakes again—they are exquisite. There was no ‘getting used to them’ phase as we thought there might be with their extra power, they just seem like they are the way brakes should always have been. Using conventional brakes seems like dragging your toes to stop by comparison to the disc brakes. And not wearing our rims down with braking means that the wheels and spokes stay cleaner, which means our hands stay cleaner when we run a bike lock through the wheels. And we are savoring other smaller choices that Bill made, like the new, more ergonomic handlebars; our new saddles (seats); and the slightly bigger bottle cages for our water bottles. The bikes are a joy to ride and the new features make them more comfortable, safer and a little easier to maintain. Yeee-haaaa! We are east of Bordeaux, France in the city of Perigeaux on our way to see replicas of the Lascaux cave paintings in the Dordogne. We hope to visit several caves and associated museums while in the area. We are still deciding whether to make a 1000 km (600 mile) detour and do a loop of southern France to visit more prehistoric sites along the eastern and southern borders of the country or to turn north and continue on to Iceland. But though the route is ambiguous at this point, the weather has asserted itself and we are finally having a novel streak of sunny, warm weather. Rain is back in the forecast in a few days but it's been nice to have a spring-break.